Each year the scouts of Troop 28 head to New Hampshire for a backpacking and hiking trip in the Presidential Range of the White Mountains. The group of nine included Christian, Robbie, Evan, Greg, Andrew, Jack, Mr. Hillman, Mr. Berube and Mr. Ackley. On Saturday, the scouts left Cohasset at 6:30 a.m., arriving at 11:00 am. They backpacked all of their food and gear up to the Appalachian Mountain Club’s “Mizpah Springs” Hut 3 1/2 miles away where they set up their camp near the hut. On Sunday, they broke camp at dawn and hiked over 12 miles of mountain trails, to the summit of Mount Pierce (4,310 feet). Then they went above the tree line along the Crawford Path across Mount Eisenhower to the summit of Mount Franklin (5004 feet). From Mount Franklin, the scouts ascended Mount Monroe (5,372 feet) and agreed that the best views along the trail were at this peak. From Mount Monroe, the trail descends to the AMC’s “Lakes in the Clouds” hut. The hut was closed but the scouts rested there for lunch. 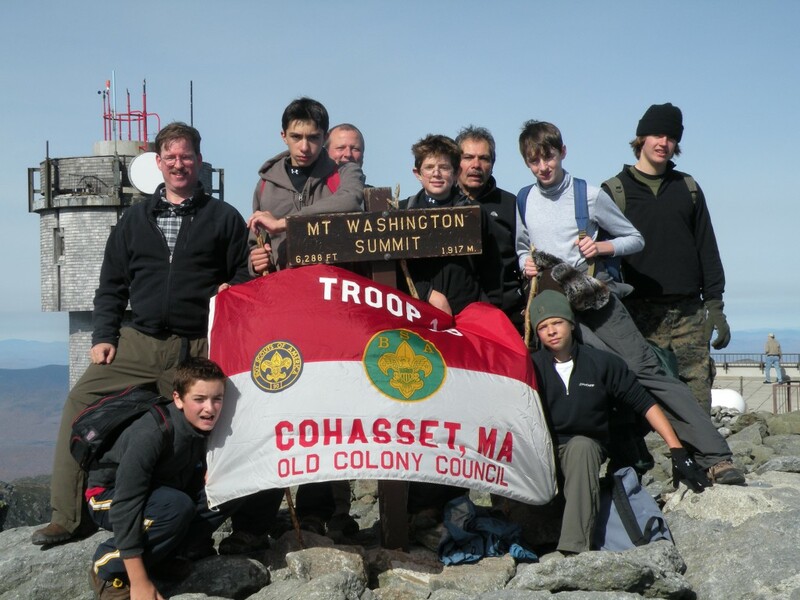 After lunch, the scouts climbed to the summit of Mount Washington (6288 feet). After a brief stop at the top, the scouts returned along the trail, skirting the peak of Mount Monroe and returning to camp at dusk. The weather was ideal for hiking – clear and cool, with occasionally stiff breezes. The views from the peaks, and from the trail above the tree line, were spectacular. On Monday, the scouts broke camp and packed everything that they brought with them, following the Boy Scout’s “Leave No Trace” guidelines. The return trip with full gear, descending nearly 2,000 feet, was difficult, particularly after the previous day’s hike, but the weather remained clear and the hike was a success.